A particularly famous and spectacular autumn festival held from October 9th to 11th, is the Nagasaki Okunchi 長崎おくんち, with gorgeous floats, parades, odoriko dances, as well as their lion dance. Begun as a celebration of autumn harvests in the late 16th century it became a shrine festival when Suwa Shrine was founded in 1642. See some spectacular photos here. In the city of Karatsu, Saga prefecture, on Kyushu island, the Karatsu Kunchi (唐津くんち; the suffix “kunchi” simply meaning festival) is a major annual Japanese festival event that features daily parades (between the 2nd to the 4th) of fourteen hikiyama, massive floats in the form of samurai helmets, bedecked with paper lanterns, sea bream, dragons, turtle and other fantastical creatures, all constructed from wood, lacquer, and other materials. The Hikiyama being used today, were offered to Karatsu Shrine between 1819 and 1876. On the second day, with the portable shrine of Karatsu Shrine leading the way, the Hikiyama are pulled to the sand beach of Nishinohama, a sandy beach (source: Karatsu Kunchi, Wikipedia and Japan Atlas Festivals. “This autumn hokku is from the 9th month (October) of 1822, when Issa was in the area near his hometown. One name for the 9th lunar month was the Chrysanthemum Month, because chrysanthemums came into bloom then and especially because the Chrysanthemum Festival, one of the five large seasonal festivals, was held on 9/9. Actually it was held from 9/8 to 9/10, so it was a very big festival during which people went around and greeted all their neighbors and relatives and friends to wish them good health and a long life. According to Daoist legend, chrysanthemums were such a vigorous and refined flower that if you drank dew from the petals of certain large chrysanthemums growing in the mountains, you could live an extraordinarily long life. The next best thing to that was to drink “chrysanthemum sake,” or sake with chrysanthemum petals in it, which was believed to protect the drinker from sickness and bestow long life. Numerous cups of chrysanthemum sake were exchanged during the Chrysanthemum Festival at parties and during visits to people’s houses to make festival greetings. Since the Chrysanthemum Festival was held around the time of the fall harvest, informal festivities tended to be extended far beyond 9/10, and for chrysanthemum lovers the 9th month could almost be called the Sake Month, since drinking chrysanthemum sake was thought to be healthful, and the mood was festive and favored tipsy merrymaking”. It was around the 8th century AD that Chrysanthemums were introduced into Japan and adopted by Emperor Gotoba 後鳥羽 (1180-1239) as an emblem for his official seal. Drinking the dew off a chrysanthemum was supposed to help retard aging or according to Chinese/Taoist folk beliefs, to grant immortality, see commentary on Ki no Tomonori’s poem 270, Kokinshu Book Va: Autumn part 2 (249-280) A day before the Chrysanthemum festival) there was also a traditional practice of placing cotton silk floss covers outside over the chrysanthemums to catch the evening dew. On these morning of the 9th, these garments were used to wrap the body of court ladies, a custom since the Heian Period. This was said to ward off evil and lead to a healthy ripe old age. Summer cotton garments are traditionally put away after this date and the winter garments taken out in their place. The Chrysanthemum 9-9 festival was likely derived from the Chinese Double Ninth festival, which may in turn, have had ancient origins in the Indian subcontinent. 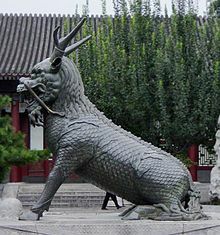 Chinese folklore suggests that the Double Ninth festival originated as a day to drive away danger and pestilence and a celebration of the defeat of monsters. “The Navatri festival corresponds to a nine-day Taoist celebration beginning on the eve of 9th lunar month of the Chinese calendar, which is observed primarily by the ethnic Chinese of Min Nan linguistic group in Southeast Asian countries like Myanmar, Singapore, Malaysia, Thailand and also the Riau Islands called the Nine Emperor Gods Festival. The beginning of spring and the beginning of autumn are considered to be important junctions of climatic and solar influences. These two periods are taken as sacred opportunities for the worship of the Divine Mother Durga. The dates of the festival are determined according to the lunar calendar. Navaratri or Navadurga Parva happens to be the most auspicious and unique period of devotional sadhanas and worship of Shakti (the sublime, ultimate, absolute creative energy) of the Divine conceptualized as the Mother Goddess-Durga, whose worship dates back to prehistoric times before the dawn of the Vedic age….Further incarnations of the Divine Mother are: Brahmcharñi, Chandraghanta, Kushmanda, Skandamata, Katyayani, Kalratri, Mahagauri and Siddhidatri in that order. These nine manifestations of Shakti, are worshipped as “Nava-Durga”. The fifth chapter of the Rudra Sanhita of Shiva Purana also vividly describes the various Divine Emanations of Durga…. The Japanese idea of hina doll gift-giving to daughters may have been originated in India where Navaratri Golu dolls and figurines are displayed in the Navratri festival for girls and women in South India (Source: Navratri (Wikipedia). 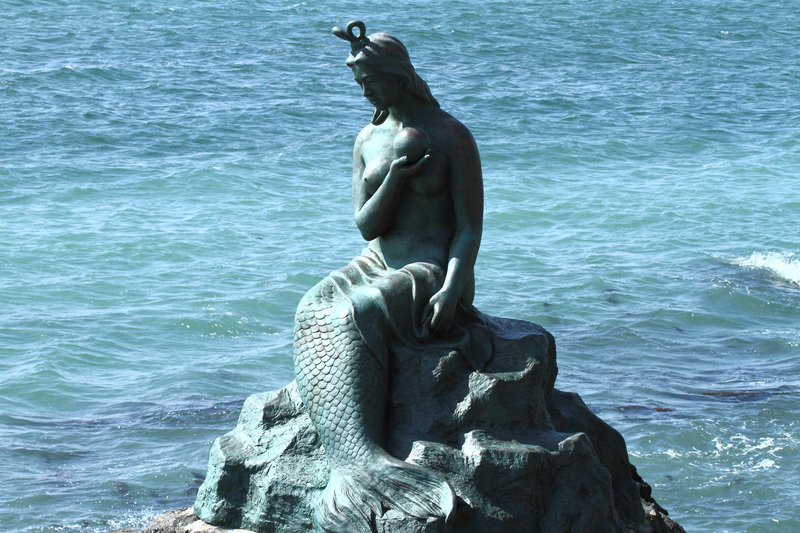 This is a nine-day sacred period for the worship of the Mother goddess Shakti or Durga, which is said to a devotional practice of purification by the water-washing at the waterfront (similar to the Japanese o-harae practices) carried out since prehistoric times before the dawn of the Vedic age, prescribed according to the Gayatri Mantra of the Puranic verses. The Navratri Golu doll traditional display bears a remarkable resemblance to that of the Hina doll display. 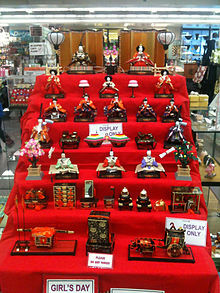 While hina dolls are set up on steps to resemble the Heian period’s imperial court, the Golu dolls are similarly arrayed on steps or padis (in Tamil) in usually nine or odd numbers like seven, or five, representing a durbar or the court of Goddess Durga before she leaves to eliminate Mahishasura or the buffalo-demon. Many a collection of dolls also carry themes from mythology, like the ten avatars of Lord Vishnu, scenes enacting the romance of Radha and Krishna or events from the life of lord Krishna as a child, etc. While the emperor and empress are at the centre of the hina doll court display, a pair of male and female dolls called Marapachi Bommai Dolls, carved out of this reddish wood called “Marapachi” are at the traditional core of the Golu display. Marapachi bommais are special dolls from Tirupathi, the land of Lord Venkateshwara. The word Marapachi is said to be a special kind of wood that has medicinal values and hence the name Marapachi Bommai. 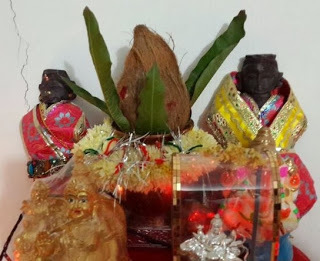 A pair of the Marapachi dolls are gifted and presented by the parents of the bride at every wedding so that the bride might initiate the yearly tradition of Navarathiri Gollu in her new home with her husband. Tradition dictates that the bommais are brought out in display, every year, at the time of Navarathiri. These bommais are couples dressed in their wedding attire, start of the bride’s Gollu collection, which then grows over the years with the addition of various clay dolls signifying various Gods and Goddesses. How the Indian Navrati Golu or marapachi doll tradition found in the southern states of India, viz. Tamil Nadu, Andhra Pradesh and Karnataka, could have been transferred to the Japanese Heian court or influenced the Edo period hina doll giving to daughters- practices is unknown, but the marked similarities suggest a definite connection between the two. The origin of the Hina-doll festival is often attributed to the ancient Chinese ceremony (held on the 3rd day of the third month of the lunar calendar) of conducting purification rites by the waterfront when paper or straw human doll effigies were cast out onto the river or sea as substitutes bearing away one’s iniquities. These practices have been practised since the ancient Nara period. These paper human figures are said to have been the origin of the Hina doll. The glamorous noble court culture flourished in Japan from the Heian period. The Hina doll, or Kyo-hina (literally “Kyoto doll”) which was the Imperial-Court doll and the Ichimatsu doll together with a variety of different dolls of the Heian period were made by famous artisans. Hina dolls are clothed with traditional costumes (namely the Jyuni (12) Hitoe) derived from different periods of the history. The words “Hiyina” and “Hiyina Play” were found in the ancient Japanese literature works of “The Tale of Genji” and “Makuranososhi”. While the word “Hina” at the time conveyed the idea of lovely and cuteness, the Hiyina Play was a play in which the pair of boy and girl dolls would be dressed up with costumes and accessories. However, the “giving doll as a gift” was became a custom only in the Muromachi period. During the shogunate of Tokugawa Iemitsu (1623-1651), it became customary to make a present of a set of hina dolls to all the baby girls newly born in the inner palace. 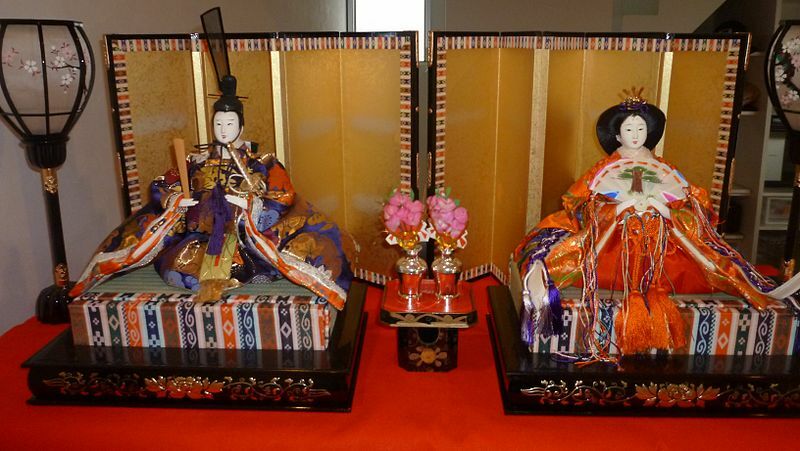 It is said the custom began when members of the Shogunate’s cabinet presented a set of hina dolls to Chiyohime, eldest daughter of Iemitsu, on March 1, 1644, to commemorate her 7th birthday. The making of increasingly luxurious commoners’ hina doll sets, however, are said to have been popularized and to have caught on from the glamorous and splendid “Youshoku Hina” doll collections and displays of the royals, courtiers and the samurai in Kyoto (the birth place of the study of the well-versed usages in practices of the royals and nobility). “Youshoku Hina” (1751~72), were dolls clothed in noble costume in style of the Kyoto noble families of Yamashina and the Takakura and were regarded a way to preserve and pass on the royal culture. Possibly, some Indian migrant monks, craftsmen or merchants in the service of the Tokugawa shogunate gave the warrior classes the idea of gift-giving, eventually merging the symbolism of the Chinese-derived Peach festival, the nagashi-bina practice of launching straw or paper effigy dolls onto rivers with that of the Chrysanthemum 9-9 festival with the Hina matsuri festival (see below). “Also called “Momo-no-Sekku (Peach Festival),” it originates in “Jomi,” representing one of five seasonal periods, which falls on a day of serpent in early March. Sekku, or festival in English, held on each period has been an event wishing health and driving the season’s sins and bad luck away using the seasonal flowers, trees and herbs, since the Heian Period (794-1185). Even the Jomi day, however, was gradually taken over by “Nagashi-bina,” a ritual of setting paper dolls adrift on rivers, together with people’s sins and bad luck. “Hina” or “bina” in Japanese originally mean a “model” in English, which refers to a doll that is modeled after people. Dolls thereby started to spread as an indoor play thing and people gradually started using them as displays on the Peach Festival. We can even find the word “dolls” in the famous Tale of Genji. Dolls in the early period are said to have been extremely simple, and it is presumed that children played with them, changing their clothes and playing at keeping house. The archaic use of Taoist doll amulets charms in Central Asia could have been a practice learned from contacts with the Graeco-Indo-Iranian world. According to Velizar Sardovskis Ritual Spells and Practical Magic for Benediction and Malediction: From India to Greece, Rome and Beyond (Speech and performance in Avesta and Veda), pp. 334-348 the use of doll effigies and amulet figurines made of various materials was common among the Iranians, Greece (Romans too) and the Near East (Egyptians and Assyrians) and with the ancient Indians too. The pre-Islamic Arab nomads as well as the Indo-Iranians were known to have been fond of many forms of charms and amulets (see p. 16-18 of Fifty Charms (Iran)). Both India and Japan, share a tradition of prehistoric clay figurine-making that goes back to the respective Indus Valley and Jomon periods. During the mid-Edo period, a tradition separate from that of the Ninth Day festival, called Hina Festival became the first festival for girls, when the custom for Japanese girls also developed (paralleling the Indian one) for them to bring their own Hina dolls with them when they got married. The Hina Festival holds special symbolism as a prayer for girls’ healthy growth and happiness in life. Today, probably on account of the high cost of the hina doll sets, it is more common for a set of heirloom hina dolls to be given by grandmothers upon the birth of a grand-daughter (a separate set for upon the birth of boys). While potted peach blossoms are included in the Japanese display suggest immortality or long life, a kumbham pot of pomegranate (or coconut) suggesting fertility, amongst mango leaves is arranged either at the top most level or at the bottom), the latter receiving ritual worship during the nine days of Navratri. (As the Hina festival held in spring, peach blossoms are seasonally appropriate). Like the doll effigies in the nagashina-bina rites, the hina dolls are thought to serve the function of trapping and containing bad luck and so they must be put away after the period of display. Hina ninogyo doll (雛人形) set, featuring the Emperor and Empress as a couple in Heian dress, with peach blossoms in the centre. The marapachi dolls are also thought to have been originally presented to the bride and the groom at the time of marriage as toys for the couple … in times past, it was not uncommon for two children, to be married at the age of ten in the Indian culture and society. “They were worn as amulets to protect children wherever they went, placed by their bedsides to divert evil from the sleeping infants and promote future fertility. Temple records hold that in the 26th year of Suinin Ten’no’s reign (3 BC) at the shrine dedicated to the Shinto goddess Ameterasu at Ise, a grass doll was blessed by the shrine priestess and thrown into the river Isuzu to purge all human sins. Although this tradition is believed to have been part of popular culture long before this event, the Ise hina is one of the earliest record of a doll as warding agent. In later centuries tradition also holds that Ise Shrine sold male and female doll pairs that could be dressed and were meant for display throughout the year, presumably guarding the home. These would have been kept on the kamidana, a shelf often in the kitchen area which housed images of different protective gods in the Shinto faith. The display of dolls on the shelf is seen as precursing the more elaborate display of the festival. In China, cut-out paper dolls were used by Taoist priests for both positive and negative influences. Paper dolls in Japan, known as hitogata, the old reading of the modem word ningyô, seem to have appeared soon after paper technology was introduced by the Korean Priest Doncho in 610 AD. Also known as kami-bina (paper hina), they were often used in misogi or purification rituals as “stand-ins” and burnt yearly to get rid of any evil influences or sins. The word ‘hina’ itself, although translated as doll actually seems to be a contraction of hitogata or man shape, referring back to the use of hina as stand-ins for people. Two other important early forms of talismans were theamagatsu (“heavenly child”) and hoko dolls. Also known as guardian dolls or hoko-hina (“lowly child dolls”), these figures were kept by a child’s bedside to ward off evil. Amagatsu were of simple construction. Pairs of sticks were strapped together forming a T-shape, a stuffed silk cloth head was attached and clothing draped on it. It is thought that a child’s clothes would be hung on the T-form of the amagatsu to take any evil elements away from the clothes. The hoko consisted of white silk stuffed with cotton and was presented to a child on his / her birth, often as an ubuyashinai (gift to a baby on the 3rd, 5th, and 9th nights). Used for both boys and girls, these dolls were a constant in their early life. Boys would keep them until the age of 15, when their “guardians” would be consecrated at a nearby shrine. Curiously, there does not appear to be a parallel doll amulet custom in the Korean culture, nor the equivalent of the grand hina doll display in either the Korean or Chinese court culture. The closest parallel practices are to be found in faraway India. Finally, on the subject of autumn harvest festivals, there are a great many harvest festivals in Japan, so many that we have not covered them all, having focused only on the 9-9 festival. Find out more about other Japanese harvest festivals in the article links below.